Date of introduction: 1993 Display technology: n.a. Size: 13.5" x 12.0" x 3.7"
The cute Teddy Touch & Tell continues the ideas of the previous Touch & Tell and the wonderful Touch & Discover. The idea of the product is simple: Switch the game on and wait for the instruction. The only thing you need is your fingertip. This educational toys addresses children aged 2-5 years and introduces the Alphabet, Numbers, Colours, Animals, Music and a lot of other intersting things with a friendly voice. Dismantling the Teddy Touch & Tell reveals technology very similar to the various Touch & Talkies. The Main-PCB (printed circuit board) is even simpler than the previous Touch & Discover and uses only two integrated circuits, one of the a TSP50C11 Voice Synthesis Processor. 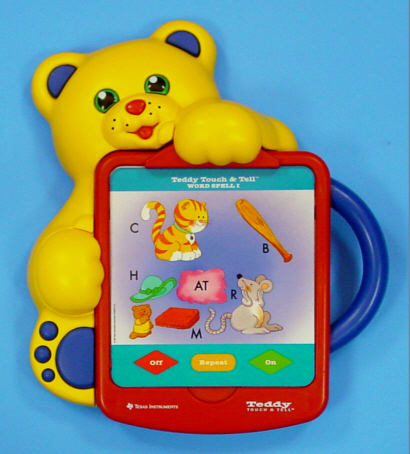 The Teddy Touch & Tell uses exchangable speech ROM's in an expansion port. This gives you access to other game-pictures than the provided Bluish Purple ones. Three different color-coded Teddy Touch & Tell Cartridge's are known : Green, Blue, and Reddish Purple. In Germany this toy was sold as "Teddy, der sprechende Bär" (Teddy - The Speaking Bear) and in France as "Le Petit Ours Magique" (The Small Magic Bear) with adopted voices.